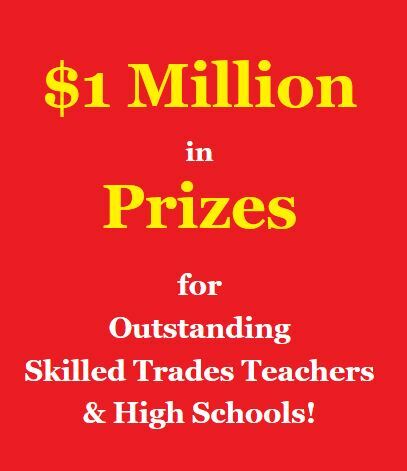 Harbor Freight Tools for Schools awarded more than $1 million in cash and prizes to the teachers of 52 U.S. public high school skilled trade programs. Three first-place prizes of $100,000 were awarded with $70,000 going to the public high school skilled trades program and $30,000 to the individual skilled trades teacher or teacher team behind the winning program. In addition, 15 second-place winners each received $50,000 with $35,000 going to the program and $15,000 to the teacher/team. Wes Crawford and Josh Gary, instructors of the Woods Manufacturing, Welding, and Agriscience program at Sutherlin High School in OR were among the second place winners. Ignacio High School in CO.
Harbor Freight Tools for Schools, a program of the Smidt Foundation, is dedicated to the advancement of skilled trades education in America. The Teaching Excellence Prize was created to foster and shine a light on excellence in skilled trades education in public high schools. This was the second annual Teaching Excellence Prize. Nominations for the 2019 program will open next spring. Learn more about the HTFS Teaching Excellence Prize.